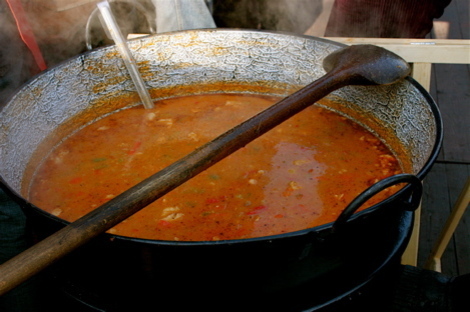 Did you know that in Hungary, Goulash, or more properly gulyas (meaning a herdsman), is actually a soup? This peasant dish became fashionable in the nineteenth century when Magyar nationalism reasserted itself in the Hungarian lands of the Austrian Empire. Like so many other bastardised recipes, genuine goulash is slightly different from Anglo-American interpretations, which have turned it into a thickish stew. Here's the Greasy Spoon version. I've kept the correct ingredients to make it more authentic but usually go for a thicker, rather than a soupy sauce. Heat some butter and oil in an oven-proof casserole dish. Slice up some medium-sized onions, and cook them gently, until they soften. Next add a sprinkling of caraway seeds, and some crushed garlic. Cook for a minute or so. Now add your beef (which you have previously cut up into cubes; stewing beef is ideal). If you want a thick sauce, you can dust your beef cubes in plain flour, salt and pepper, beforehand. However, a warning. If you want to make friends and influence people in Budapest, this is not the way to do it. Sprinkle in a generous amount of sweet ground paprika, and a handful of salt- so that the meat in the bottom of the pan is well covered. Stir, so that the meat is browned. Now it's time to add your vegetables. For this dish, I like them diced, except the peppers, which I like sliced. Into the pot go: diced carrot, a tomato, celery, and sliced green bell-peppers. Pour over some water, or stock, and simmer gently until the meat is nice and soft. If you are using stewing steak, this could take quite a long time. If you're using a more expensive cut, your cooking time will be shorter. I'll leave it up to you. Towards the end of the cooking, add your diced potatoes, and simmer until they are cooked. Finally, add a few pasta pieces and cook for a further five minutes. Serve the whole shooting match with noodles or hunks of hot, fresh white bread. Oh- and a tip; try and find some genuine smoked hot or sweet paprika (in small tins), which will give your goulash a deep red colour. Avoid at all costs the cheaper stuff (which goes brown) and has a far blander taste.